Over the years Magnums Hotel has evolved into one of the top entertainment venues in Queensland with frequent guests from around Australia making the trip to the Whitsundays to experience what Magnums has to offer. 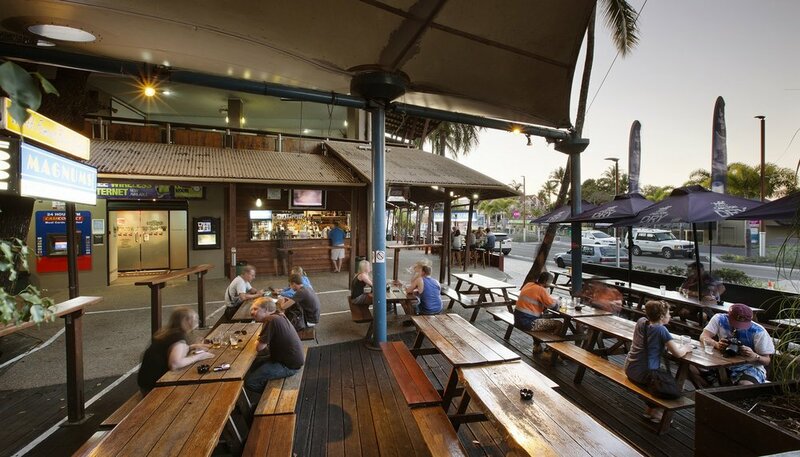 Magnums Hotel is located in the middle of the main street of Airlie Beach and is open from 10am till late 7 days a week. Magnums Hotel is the largest entertainment venue in Airlie Beach, with multiple levels boasting: 6 bars, 5 pool tables, Biggest TV north of Brisbane, 40 gaming machines and Airlie's largest beer garden. With regular touring acts from around Australia and the world Magnums Hotel is the hub of the entertainment scene in Airlie Beach. Whether it's our New Years Eve party with over 4,000 party people or our Thursday night live Cane Toad Racing you're sure to make some new friends and memories at Magnums. The Terrace Bar is situated upstairs above Airlie's top beer garden. Featuring sea view of some of the 74 Whitsunday Islands along with big screen TVs and a pool table for your enjoyment, it's a great place to relax and is a local favourite spot to watch the world go by. The Terrace Bar also doubles as one of the best function areas in Airlie Beach, perfect for birthday parties, hens and bucks nights or just a work gathering. This is where the action happens! With multiple levels and bars we regularly feature touring acts from around Australia and around the world. The Party Bar is an institution in Airlie Beach! Open every Friday and Saturday night from 8pm through till the early hours, our resident Djs keep the party going with the latest dance anthems. Don't forget to catch up with one of our promo girls to see what events are taking place on centre stage tonight! The hub of Airlie Beach, Magnums Hotel's Beer Garden is a local's and traveller's favourite, and it's not hard to see why. The bar is fully stocked and complete with 16 different ice cold beers and ciders on tap. The Beer Garden is perfectly situated in the heart of Airlie Beach and has live music seven days a week with local and touring musicians. With regular pub favourites from cane toad racing, putt for cash and goldfish racing, there is always something going on in Airlie's number one beer garden.